Big Star Doors are doors that restrict progress to certain required parts of the game until the player has the necessary number of Power Stars. They have appeared in Super Mario 64 and its remake Super Mario 64 DS inside Princess Peach's Castle. 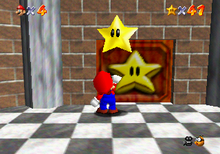 Like most locked doors in these games, a certain number of Power Stars must be obtained before they can be opened (although Big Star Doors require many more Power Stars than regular doors). Once unlocked, the doors will slide open allowing Mario to enter. Only Mario can unlock a Big Star Door, but once it is unlocked, any character can enter it. The first floor door leads to Bowser in the Dark World. 8 (12 in the remake) Power Stars are required to open it. The second door is in the basement and requires 30 Power Stars to be opened. Dire, Dire Docks and Bowser in the Fire Sea are behind it. The third door is on the floor above the second floor lobby at the top of the stairs. 50 Power Stars are needed and behind it are Tick Tock Clock, Rainbow Ride, and Wing Mario Over the Rainbow. The last door leads to the final battle with Bowser. It doesn't require any Stars to open, but has a staircase that never ends behind it unless Mario has at least 70 Power Stars (80 in the remake). In the remake, if anyone other than Mario attempts to open the final door, they will still encounter the Endless Stairs, regardless of the number of Power Stars. In the Super Mario Mash-Up Pack in Minecraft, there is a painting of a Big Star Door. ↑ (February 5, 1998). Super Mario 64 FAQs. Nintendo: Super Mario 64 Strategy (Internet Archive: Wayback Machine). Retrieved February 23, 2018. This page was last edited on July 28, 2018, at 08:07.